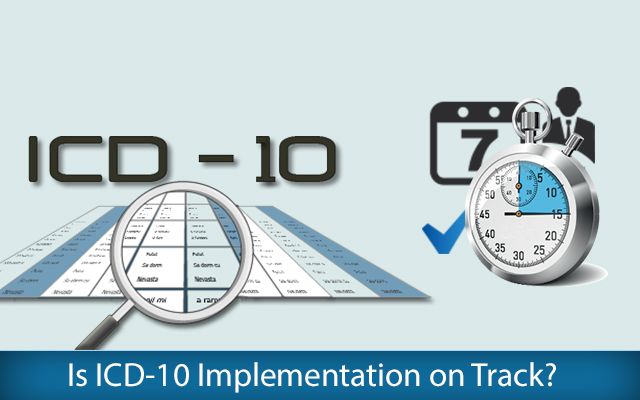 Is ICD-10 Implementation on Track? Is ICD-10 more difficult to use compared to ICD-9? Well, first and foremost there is no choice available; all stakeholders covered under HIPAA, e.g. Patients, Providers, Laboratories etc., are required to start using ICD-10 codes if they are to stand a chance of getting reimbursed for their claim after October 2014. Worker’s Compensation and Auto Liability claims are the only exceptions to the rule. The only similarity between these 2 approaches is the process of looking up for codes. The differences otherwise start right from the format. While ICD-9 codes uses are generally numeric with 3 to 5 digits, the ICD-10 codes are alphanumeric with 3 to 7 characters. Most important difference lies in the fact that ICD-10 will require additional documentation to be which in order to provide more information for the codes chosen. External circumstances and the location of injury or accidents need to be captured. Thus from a current number of 13000, when ICD-10 gets implemented the number of codes will go up to 68000. All this is being done with the intention of capturing the exact details of the cause of ailments of patients. The higher the precision of diagnosis, the better the chances of administering the best possible treatment. Thus, rolling out an ICD-10 is not to be looked upon as an update to the ICD-9 code set. The lack of specificity in the former is what might have triggered of the need for the later but its implementation is a comprehensive process. A coder for example cannot necessarily handle the job in isolation unless all the relevant information is available in detail. In any case, the best person to program manage the roll-out of ICD-10 coding standards in a healthcare setup has to be either of the three – the physician, the practice administrator/office manager, or the billing manager. The concerned person has to have the confidence of all the staff and the required level of authority to ensure a smooth transition. Each of the stages – assessing, budgeting, planning, communicating, training, implementing, and monitoring requires good astute leadership to drive the implementation. Although there are mapping tools now available, they do not necessarily provide a definitive code for a situation because a one-to-one mapping is not always possible. Some other concerns expressed include the difficulty of documenting patient encounter and the difficulty in choosing the right diagnosis code. One of the surveys conducted indicated that cost for a 10-physician healthcare setup to overhaul its practice management system and electronic health record software was approximately going to be more than $201,000. This can act as a huge deterrent, given the high amount of investment needed, for setups of similar or larger sizes. A few providers though are hopeful that their respective vendors for PMS and EHR would handle the cost of upgrading since they will not be left without a choice. However, the starting point of all this – co-ordination among the stakeholders has unfortunately not at the level at which it is expected to be. ICD-10 implementation is not just changes to be made to software; it will require a lot of healthcare software testing and training on the part of providers. Unless enough time and effort goes into the last 2 areas , providers might have to deal with a shock when they take a look at their cash flow post Oct 2014. One of the reasons why the implementation could be a tough one of achieve is because it is being planned simultaneously scheduled with the Stage 2 Meaningful Use of EHR and state Health insurances exchanges. Besides the financial angle, the sheer amount of time and energy that all such parallel implementation will require from all concerned people in healthcare setups is going to affect their ability to meet their primary responsibilities – that of providing good care to their patients. But inspite of all the uncertainties, physicians do not have a choice but to see that they themselves are aware of the coding fundamentals and are actively driving their teams towards a planned implementation. If not, a rude shock seems inevitable. We provide healthcare software development services. If you would like to know more about our expert healthcare software developers, please get in touch with us at Mindfire Solutions. This Post was posted in Software and tagged certified healthcare software testers, Certified testing company India, develop hipaa compliant patient portals, Develop medical practice management system, emr software developers, healthcare application testing, Healthcare development services India, healthcare software developers, healthcare software development, Healthcare software development services, healthcare software maintenance, healthcare software testers, Healthcare testing services, hire healthcare developers, iphone medical app developers, offshore healthcare software development, outsource healthcare testing services, outsource mhealth development, Top HealthCare Testing company, web-based practice management system development. Bookmark the permalink.